Maybe it was at the top of your goal list this year. Maybe you have been lurking on The Work at Home Woman for months. Maybe you have been talking about it to friends and family. But, the truth is, you still don’t have that remote job you have been dreaming about. Well, listen up buttercup. We are here to share some tough love that will get you fired up and moving. Maybe you are under the impression that finding a worthwhile work-from-home job should be easy. In some ways, I think it is harder than finding traditional in-office role. Why? Well, to start, it is not a work culture that every organization embraces, so it can be harder to find these opportunities. Additionally, you as the candidate have to go further to prove you are responsible, dependable, and able to be productive in a remote environment. The best thing to do is forget your past job hunting experiences. Not only has the job market probably changed since your last search, but also searching for telecommuting jobs will be a whole different animal. There are differing opinions on how long it should take to get a job. I have seen an average of 43 days from a lot of experts. Some say one month for every $10,000 you want to earn. Still, others have claimed it will take an average of 16 weeks. And most everyone agrees that work-at-home jobs take longer than the average, whatever that may be, to land. So, the bottom line is you can’t give up. Now, if it is a matter of economics, you may have to make some compromises and get into a traditional job in the short term (there is a lot to be said for being able to buy groceries or pay your electric bill). But, that doesn’t mean that you shouldn’t continue to look for a more ideal work-at-home position to meet your long-term plans. Keep at it. Diligence will pay off. There are a lot of things to do to help you find the work-at-home job that is right for you. Maybe you aren’t sure what you want to do. Try taking an online class. Maybe the job search process is making you weary. Sign up for job alerts and set a schedule where you allocate a specific number of hours each week toward your search. Maybe you are hoping this is going to happen in more impersonal ways (with you finding a job online, you submitting your application or resume, and voila, you have the job). Well, chances are, that is not going to work. There may need to be some hustle involved, through informational interviews or coffee meetings with potential employers, making meaningful contact with your professional network, or taking the time to personally connect with recruiters to discuss any flexible work arrangements that can be made. All of that takes a personal touch, which takes more time and work. When doing any job search, it is important to put your best foot forward. That is no different when considering a work-at-home position. Make sure your resume is in tip-top shape by having a trusted friend or professional review it. Have you done a search on your name to see what comes up? That’s exactly what a potential employer is doing, and there could be negative consequences for what you have or don’t have out there on the Internet. When it comes to social media, I’d recommend taking a conservative approach, so polarizing comments, questionable pictures, and anything else you wouldn’t want an employer to see should be taken down or made private. If you don’t have a LinkedIn profile, get one. It is free and relatively easy to set up (and a perfect place to let the world know you are looking for a work-at-home opportunity). What about your follow up? Are you taking the time to send personalized ‘thank yous' to the people you have spoken with or those who have helped you in your search in some way? It is an easy way to look extra polished and says a lot about your professionalism. The bottom line is that in this competitive marketplace, job seekers have to go the extra mile to be sure they are coming across as professional and competent. This one is an easy trap to fall into. The traditional job search route isn’t always the answer because these opportunities tend to be anything but traditional. 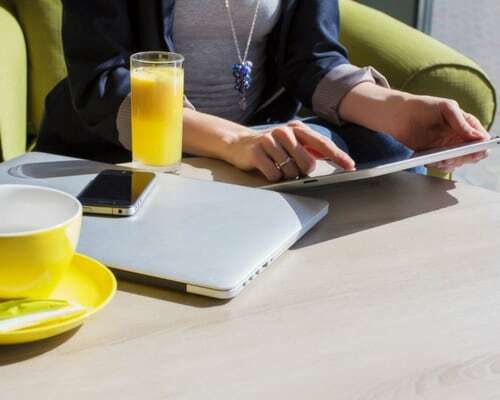 Instead of just searching online for work-at-home opportunities, maybe you should be putting together a telecommuting proposal for your current employer. Or perhaps you should plug into your network, and let your friends and contacts know about the type of work you are looking for and see if they know anyone who’d be willing to fill their position with an employee who works from home. Or maybe it is the way you are marketing yourself. Consider putting together a more creative resume, or, publishing a website about your work and experience. Perhaps you need to think about different types of opportunities entirely. Like, starting your own business, joining a direct sales organization, or even considering an on-demand job that suits your needs. Or maybe you need to be open to hybrid work arrangements that are split between a traditional in-office setting and your home office. The idea is to get creative and be willing to do things outside of your comfort zone. In the end, finding a work-at-home job that is right for you can be hard work. But the dividends, like a more flexible schedule, more control over your work environment, elimination of a timely or frustrating commute, being there when your kids get home from school, and much, much more, will pay off in the end. What obstacles did you have to get serious about while looking for your work-at-home job? What are some other reasons you can think of? What obstacles have you encountered while looking for a work-at-home job? What are some other reasons you can think of? For about a year now I have been looking for a home job. My experience was with the Air Force for 35 years in the Casualty Services Directorate. I did every thing from writing to families of casualties, data entry for the past three wars, enter digital information for the White House, congress, Air Staff. I retired in 1995 and started my own home business called Infosearch where I serviced families of missing persons. I closed that business when the internet took over finding people for clients who were looking. I loved what I did and I was good at locating people for my clients. I’ve tried to pick this up at various entities without much luck. I am wondering if there are companies or people who need this service? I’ve been searching for months and I’m not quite sure what I’m doing wrong. I’ll be sure to update my LinkedIn profile, as it doesn’t seem to even appear when googling myself. Otherwise, I customize my resume for each application along with a cover letter unique to that application. I have had people look at my resume, as I thought I must be doing something wrong. I search daily for a few hours. I don’t have anyone to send any thank-you notes to, as nothing seems to go beyond the initial application process. I’ve been searching for months and am definitely discouraged, but will certainly utilize your advice. What types of jobs are you applying for? Are you using a spreadsheet to keep track of your efforts? Are you following up a week after you submit your resume? Great advice! Number two really resonates with me because I started my blog and fitness business 11 months ago. At first I was putting in a lot of work and making no money, but perseverance paid off. Now I’m on pace to make $1,000 this month. Please take this advice. Whatever business you start give it one year before you quit. If nothing else you’ll learn from the experience and that experience of trying is worth more than money. You can do it! I suggest starting with researching the food laws in your state. Some states do not permit the sale of cupcakes (and other baked goods) made in an individual’s home. Thanks for your words of wisdom and encouragement! I was offered a position with an on-line tutorial organization, 51 Talk. When I ran into some admin issues activating my passwords for training, I contacted them immediately requesting assistance, but am yet to hear back. I have sent two emails in a week’s time, but still no response. I thought this was a legitimate job offer, but am beginning to have doubts. Should I move on? Hi Katie, I’m not familiar with 51 Talk. Have you tried to call them up on the phone? Have you done any other research on them? There are at home jobs that are asking for membership fees. 25 dollars monthly to one time fee of 77 dollars. I noticed that fees weren’t written in this blog. I am looking for an at home job. I’m not looking to sell products to possibly make 10, 000 in a month that’s not realistic. I have a strong Work ethic and I am will to do the work. However if I have to pay a monthly fee in order to prove I can work at home then I don’t want that job. That is a risk I’m not willing to take. 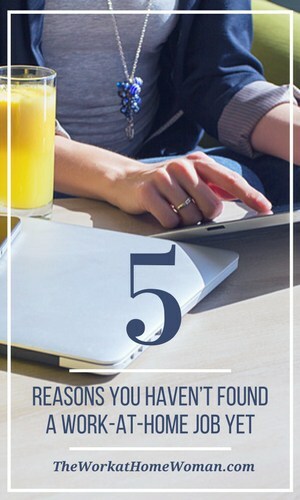 The five reasons you listed I agree with those as being possibilities as to why someone hasn’t found at home work but the fees should have been addressed in this blog as well if you are going to keep things honest. I agree, fees need to be figured into the equation, as there are often legit fees or expenses that you’ll need to consider when you’re working from home. Thank you for this post! I think my expectations may be unrealistic- finding a WAH job with toddlers making noise in the background. Back to the drawing board!